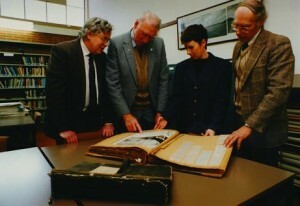 On Wednesday 29 May 1996 an historic gathering took place in Dunedin at the University of Otago’s Hocken Library. The League’s archives which have been gathered from all over New Zealand since the North Otago Branch initiated a project in 1971 to preserve radio listening material from its beginnings in the 1920’s were formally handed over. This material which consisted of QSLs, albums, club histories, books magazines and also interesting letters, telegrams, etc from the Prisoner of War Monitoring Service has now found a permanent home and can be looked after in proper archival conditions and can be inspected by any member of the public. Patron of the League Jack Fox chaired the handing over ceremony and outlined some of the League’s great achievements over the years. Particular mention being made of the Prisoner of War Monitoring Service during the Second World War and the Korean War in the 1950’s. Chairman of the North Otago based Archives Committee Peter Grenfell handed over a donation of $500 from the League to the Hocken Library to assist with the cost of curating the material. He also thanked the Hocken Librarian Stewart Strachan, and Janine Delaney the Curator of Archives and Manuscripts for their help and encouragement in accepting the League’s archives. Mr Stewart Strachan in accepting the material made reference that Dunedin and Otago University played a vital role in the early days of Radio in New Zealand. it was Professor Robert Jack of Otago University who put the ﬁrst radio programmes ever to be heard in New Zealand. Also present to record the proceedings was National radio Regional producer Jim Sullivan. Jim, well known for his Sunday evening programme “Sounds Historical” helped the League in conjunction with Arthur Cushen in 1981 in storing the material in the Sound Archives in Timaru. Arthur Cushen spoke about the vital role the League played in the Prisoner of War Monitoring Services. Arthur is still receiving thank you visits and letters from next of kin still grateful for the messages of hope received in a time of suffering. Southern Television based in Dunedin covered the proceedings and articles and photos appeared in the Oamaru Mail and the Otago Daily Times. Jim Sullivan in Sunday evening programme on 2 June I996 devoted part of his programme to the Archives and it was signiﬁcant that Marconi Day was also being observed that day. Those present included – D.X. League Patron Mr Jack Fox and Mrs Fox, Hocken Librarian Mr Stewart Strachan, Curator of the Archives and Manuscripts Janine Delaney, Mr Jim Sullivan of radio New Zealand. From lnvercargill Mr & Mrs Arthur Cushen , Mr Paul Aronsen, Mr Arthur Williams. From Dunedin Mr & Mrs Jack Blacklock, Mr and Mrs Murray Lamont, Mr & Mrs Peter Auburn, Mr Frank Wilson. From Oamaru Mr Alistair Sutherland, Mr Basil Jamieson, Mr Arthur Finch, Mr Graham Stanaway, Mr Keith Creighton, Mr Jim Smyth, Mr Peter Grenfell. After the formal proceedings everyone travelled to the Mornington Tavern for a very tasty lunch and making contact with all the Dunedin people involved. Thanks to Peter Grenfell of Oamaru for reporting this occasion. Note: Peter Grenfell has been the driving force behind the retention and safe housing of the DX League’s historical records.